As a fan huge fan of Doctor Who (especially Ten), I can't believe that it has taken me so long to venture into these audio dramas. I was astounded by the production quality; it felt like having one of the television episodes in my ears. It was incredible. This volume is number one out of two and features three stories, "Technophobia," The Time Reaver," and "Death and the Queen." Personally, "The Time Reaver" by Jenny Colgan was my favourite out of the tales; the plot was just brilliantly thrilling. However, the other two weren't bad. Additionally, since the Big Finish used David Tennant and Catherine Tate, my longing to relieve the Doctor/Donna days was satisfied; they were always one of my favourite pairs. 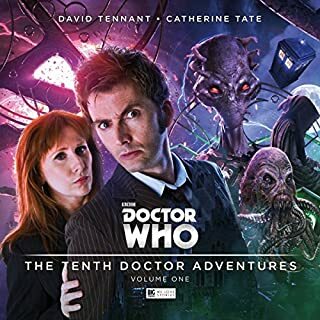 Overall, I had a great time listening to The Tenth Doctor Adventures; I can't wait to check out more of Big Finish's audio selection. I would absolutely recommend this audio masterpiece to my fellow Whovians.